Idea: Setbacks happen to all of us at one point or another – and we always look within ourselves, and the support of others, to rise. Liberty Mutual not only embraces second chances, but is a catalyst for guiding people on the comeback trail. Role: Wrote script, storyboarded video, and oversaw the editing process. Idea: We created a Skeleton game that functions in the Yahoo! and NBC Sports masthead with a user’s smartphone as the controller. Maneuver Katie's sled on bank curves and straightaways as she makes her way downhill. Concise turns increase speed for a better time. Once completed, the user is able to share their time on Facebook and Twitter, as well as engage further with Katie Uhlaender's story. Role: Mapped out game experience and design, and wrote digital copy. Copy reads: Complete the Skeleton track for your change to make a comeback like Katie Uhlaender. The banner in expanded state. The user chooses whether to play the game using their keyboard or mobile device. This screen displays once the user scans the QR code or enters the url on their mobile device. Once the phone is held in Landscape Mode, the user may tap the START button to begin the game. Computer gameplay screen. Tilting the phone left or right steers Katie Uhlaender on the computer. Mobile gameplay screen. Tilting the phone left or right steers Katie Uhlaender on the computer. The user can play again for an even better course time, which further embraces the campaign's comeback theme, or share their time on Facebook and Twitter. Idea: Use the high-resolution, flat-panel elevator displays in offices across the country to deliver a historic athlete's setback/comeback story. Role: Researched Picabo Street and wrote headlines unique to her backstory. 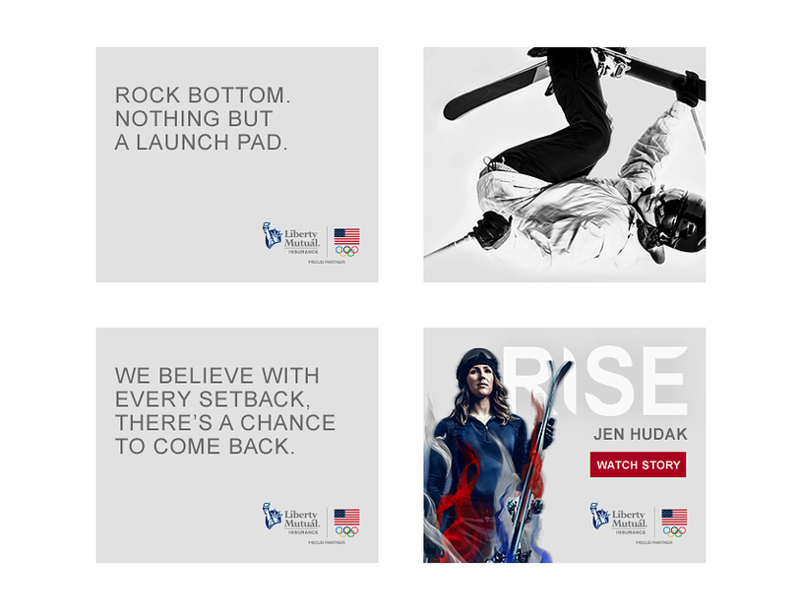 Idea: Use each athlete's setback/comeback story to deliver the campaign theme and drive users to Liberty Mutual's Team USA hub page. Role: Researched each athlete and wrote headlines unique to their backstory.